What are Boat Spotlights Best For? What are the Different Kinds of Handheld Fishing Spotlights? The moon is bright, the night is calm, and the water is still. For those who enjoy the tranquility of night fishing, you’ll know that the darkness is both a blessing and a curse. Casting shade on your arrival, you’ll find yourself hauling in huge catches by surprising the fish. On the flipside, night time is very dark, making it far harder to work. Preparing your bait and hooks becomes trickier when you can’t see – as does finding a good spot to fish and ensuring you don’t hit any obstacles along the way. With this in mind, it seems more than sensible to presume that a fishing spotlight is an essential tool for your nighttime fishing expeditions. Luckily for you, we’ve prepared this handy guide that delves into the best you can get from a fishing spotlight. If you’re trying to decipher between the myriad of products on the market, this guide is here to break down the important features to look for as well as the different types of fishing spotlights you can choose between. We’ve also provided a rundown of the fishing spotlights we feel need to be in the spotlight! We’ve given you the pros and cons of the top six fishing spotlights on the market today, and an explanation of their finest features. You boat fishing light is a very versatile device. The spotlight attaches to your boat to help you see while out on expeditions. Most often, fishing spotlights are used for night fishing. They enable anglers to traverse the waters without bumping into the edges or any hurdles that may be in the water. Acting as a guide for the boat, a fishing spotlight is imperative to prevent damage to the hull. When stationary, fishers often use the fishing spotlight to help illuminate the inside of the boat when preparing hooks and bait. The beauty of a handheld or clip-on fishing spotlight is that it can be moved around to help you see inside the boat when not looking for fish or illuminating your way. For those looking to purchase a fishing spotlight, there are some pros and cons that you should consider, as a fishing spotlight can alter the overall experience. Preparation: It’s easier to put hooks and bait together when you have a light. Bigger Fish: Night fishing brings bigger bass and catfish, especially. Fish Finder Readings: It’s far easier to read the screen of your fish finder in the light. Bugs: The white light settings on your fishing light really attracts mosquitoes and other bugs. Look for a red setting to prevent this from happening. Startles Fish: While the light is usually not too bright, it can awaken fish and scare them away – especially if you’re noisy. Annoys Neighbors: If you’re fishing on a smaller lake with houses, a fishing light can be a pest to neighbors trying to sleep. One bonus of a detachable or hands-free fishing spotlight is that it can be used to light-up a campground or tent, or can be used while night hunting. A multi-purpose tool, your fishing spotlight doesn’t have to remain on your boat. The main two differences in handheld fishing spotlights have to do with how they are powered and the way they are held. Firstly, you have to look at whether you want to have a plug-in device or a rechargeable fishing light. Secondly, consider how the light is held. Some fishing lights look similar to traditional flashlights, whereas others are shaped more like a gun. You can also find that some fishing spotlights attach to your head like a headlamp. This keeps them completely hands-free. A rechargeable fishing spotlight allows you to roam more freely as it doesn’t have a cord to restrict your movement or distance. That said, if you have nowhere to charge your light, you may end up in the dark if the battery runs out. Even if you have power on the boat, you often have to wait a long period of time for the battery to recharge before you can use it again. That said, you need to consider the battery life of your device, as well as how quickly the different settings drain the battery. For example, non-LED (traditional incandescent bulbs) flashlights set on ‘high’ are likely to drain much quicker than an LED torch set on ‘low’. You should also consider whether the light comes with spare battery packs or whether they’re available to purchase separately. The biggest advantage of a plug-in light is that you know it will always have power (as long as your generator works!). They are often a little cheaper than rechargeable devices and power up immediately. The problem with plug-in devices is often the power cord. It never seems long enough and can restrict the distance you can place the light away from the power source. This makes it harder to place it in the optimal position for finding fish or guiding the boat. Equally, very long cords get tangled and pose as a risk for those moving around the boat in the dark. LED stands for “light-emitting diodes”. Unlike glass bulbs that can crack from pressure and heat or filaments that can blow from too much power, LEDs are much more durable. Not only can they take a knock without breaking, but they also last much longer, while using far less power. In this sense, an LED fishing light will have a much longer battery life and will take a much shorter time to charge, while also having a far longer overall lifespan. While often much more expensive, an LED light will last longer and cost less to run. In order to understand how bright the LED light is, you need to look for the lumens. One lumen is the same as the light from one candle. Incandescent or traditional bulbs tend not to be as bright as LED lights – but you can look for the lumen count to check this. That said, traditional bulbs tend to have a wider beam angle than focused LEDs. While the light of an incandescent fishing light is less intense, you can see a greater breadth with a traditional bulb. Look for the beam angle on your LED light to inform you of how wide it goes, as you can now find some models with a 180+ degree beam angle. Fishing in the dark is no fun if you can’t see what you’re up to. Lucky for you, we’re seeing clearly and have managed to pick out a whirlwind of excellent products for you to take a look at. Below are our top six fishing spotlights. We’ve detailed why they catch our eye, their pros and cons, and our expert analysis to follow up. Have a glance through and you can quickly start to see which fishing spotlight is more your style. Delivering 520 lumens, this ultra-bright, LED pistol-grip spotlight works with just five watts of power. Waterproof up to six feet, this light floats face up. At 50% smaller than normal lights, this can be held easily and is lightweight. The lithium-ion battery can run for ten hours on the low setting, and charges using a 120 volt AC or 12 volt DC adapter. With 520 lumens, this durable bright light has a ten-hour battery life and variable brightness options. It’s waterproof and faces upward, but the charging port needs protection from the rain. The LED bulbs are very durable, though the light is a little heavier than one would expect. That said, its small size is comfortable for smaller hands, while also a good fit for bigger hands. This bar fog light attaches to the boat and is not made for moving around. Very heavy-duty, these extremely bright lights feature LED chips and a lamp cup for wider beam illumination. The aluminum alloy heat sinks and silicone gel prevent the lights from overheating, giving them a lifespan of up to 30,000 hours. 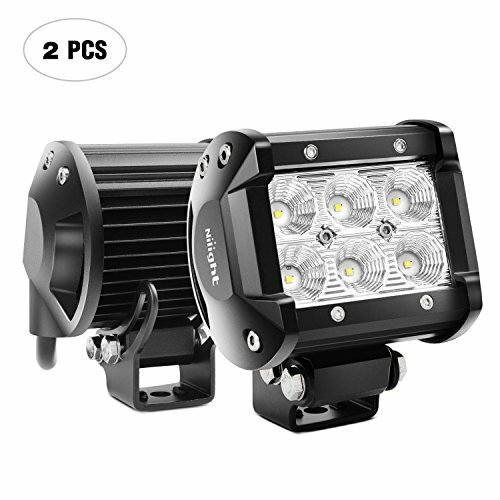 Waterproof and dustproof, the lights come with stainless steel adjustable mounting brackets. Screws and Other Hardware are Not of High Quality. 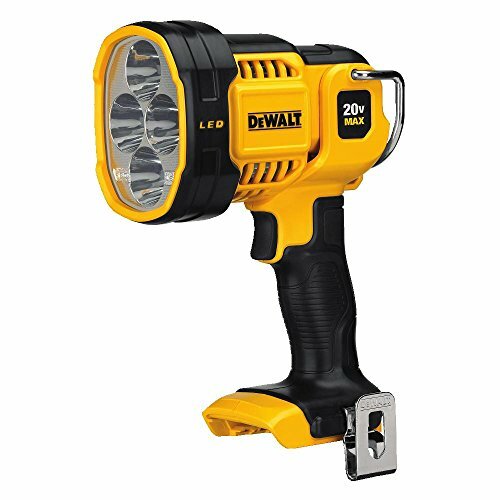 This heavy-duty light could benefit from better screws and hardware, but the light itself and included brackets are very durable. With a very long lifespan, this set of lights can be used in a variety of scenarios. On your boat, they attach well with a 45-degree adjustable swing on the mounting brackets. A great heavy-duty fully-attached boating light for night fishing. 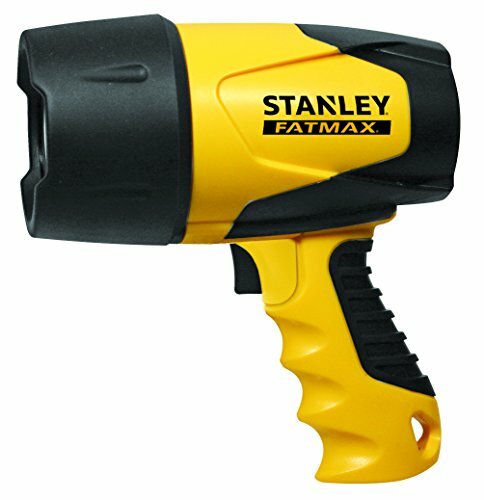 This pistol-grip handheld boating light has a high setting of 55 lumens and a low setting of 40 lumens. With an LED bulb, this is shockproof and has a 50,000-hour lifespan. This light is designed for long-range targeting using the deep-dish parabolic reflector. It is powered by four C batteries or a 12V DC power cord. Handheld Lanyard Makes it Less Likely to be Dropped Overboard. LED Technology Produces High Brightness and Also Prevents Bulbs From Shattering Upon Shock. The Cord is Shorter Than Ideal, Limiting the Light Range. 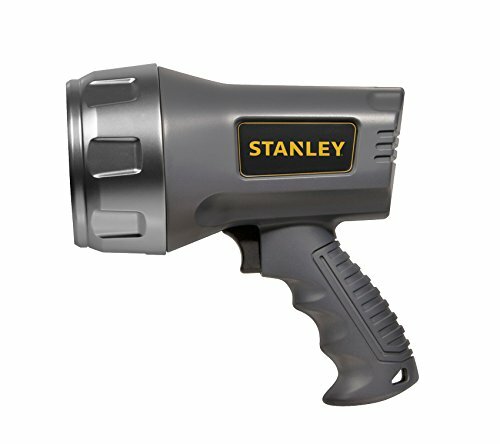 This pistol-grip light, though a little heavy, is a great portable spotlight for various fishing environments. With a wide beam, this light has a long lifespan and is extremely durable due to the shock-proof LEDs. 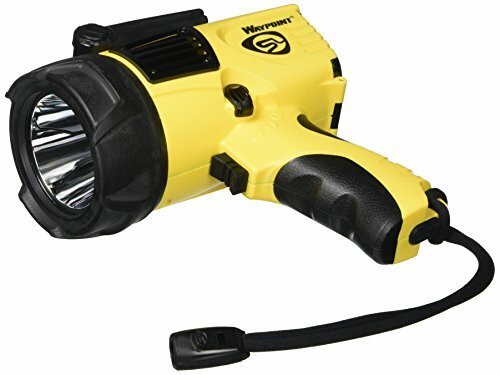 Chargeable by power cord or battery, this light is a great tool for emergency situations. Using only three watts of power, this pistol-grip LED fishing spotlight has five different lighting modes, including a halo mode. The battery will run for up to ten hours while the light itself gives off a whopping 700 lumens. The molded grip is designed for comfort, while the rechargeable device comes with both AC and DC cords to charge it up. A great basic fishing spotlight, this lightweight pistol-grip model comes with five settings and very bright LED technology. Though it could benefit with a lock for the OFF switch, it only uses three watts of power can last for up to ten hours. If you have small hands, this can be a little bit tiring to hold for long periods, however, there is a little loop to attach a lanyard. 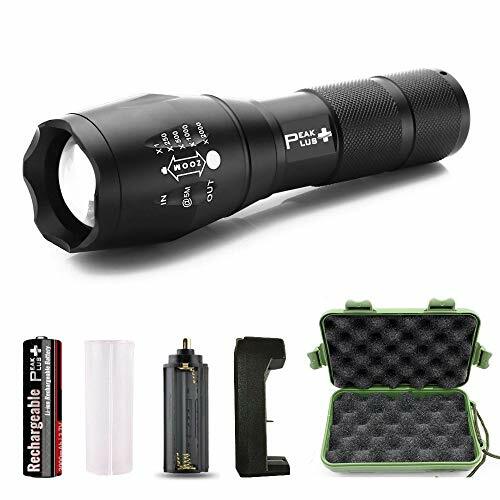 This pistol-grip handheld fishing spotlight has three very bright LEDs for white light and a fourth for a red light. There are two brightness settings and the head can twist up to 90 degrees for more variety when working. There is a belt hook on the spotlight, while the casing is designed for a high level of durability, even if dropped. This is a narrow-beam, very bright LED spotlight that’s great at what it does. The adjustable head and belt loops allow it to be hands-free, while the heavy-duty casing prevents it from damage if knocked or dropped. There are two brightness settings, but both are very bright. The red setting is great for keeping your night vision while preparing hooks and bait in the dark. Shaped more like a traditional flashlight, this torch-style fishing light works with a high-power LED. This has a rechargeable battery and comes with a protective sleeve. It also works with three AAA batteries. This is ten times brighter than a traditional bulb and is designed to be anti-abrasive and water-resistant. It has a compact design and five lighting settings, including a zoom function. This comes with a one-year warranty. This simply designed flashlight is great as an emergency fishing light due to its SOS option. It is very bright and comes with a protective case for easy storage on the boat. A rechargeable device, it comes with batteries and is ready to go and includes all manuals needed to understand all five settings. Make sure to keep the charger on the boat, as this device has a limited battery life, perhaps making it best suited as an emergency spotlight. Finding a nighttime fishing light shouldn’t be hard. You need to consider how you work out in the dark and the amount of time you like to fish. The main things to bear in mind are whether you’re willing to hold the light, whether you want to shell out for LED for durability and longevity, and whether you want a rechargeable or plug-in device. From there, the settings and brightness are up to you. Remember that compromising on quality often leads to a shoddy light, while buying something far brighter than you need may annoy the neighbors! Check out the products above, because the likelihood is that you’ll spot something you like. If not, they’re a great starting point to help you understand what you’re getting and the average amount you should budget for based on your needs.